WE OFFER EXCLUSIVE ACCESS TO THE DOOR COUNTY SOCIAL NETWORK. A ‘Born’ Digital Marketing & Media Agency, Engaging The Door County Enthusiast Everywhere. Big deal? We sense that 99% of the people that love Door County aren’t here 99% of the time. 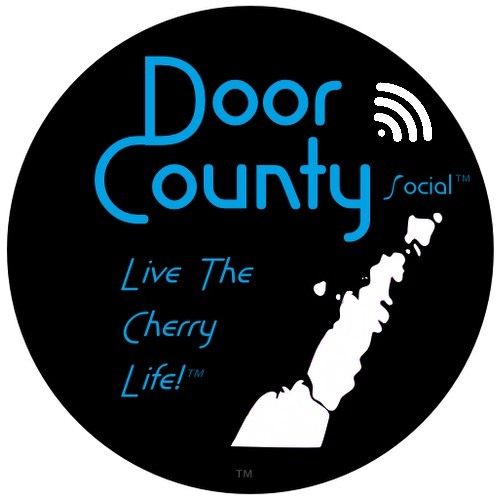 The Door County Social Network includes a giant opt-in group of Door County enthusiasts across the country across multiple digital channels. We can reach them when they are afar, maybe at work, at home dreaming about and/or planning their next visit. Reach and interact with them when they are in Door County walking, hiking, camping, boating, sunbathing, thinking about dining, evening entertainment, shopping etc… Reach them driving around Door County or even on the way. On any device. If that isn’t powerful enough, we also have proprietary digital tools / opportunities to help all our clients be positioned for tomorrow. The future is here it just isn’t widely distributed yet! We have a growing opt-in audience of over 32,000. 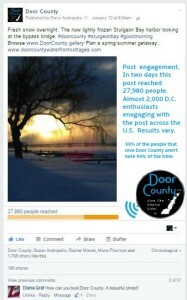 Image shows example of where Door County enthusiasts engaged with one of our digital interactive ad campaigns. Local, regional or national targeted, digital ad campaigns. You interactive ads presented through the Door County Social Network™ with over 29,000 Door County enthusiasts in our channels. Put this power to work for your business. Reach a Door County enthusiast fan base that is not possible to reach via print or radio. Affordable and very effective. Example of results. A national digital campaign (all devices) for a local resort which started Sat. night 1/30/2016 reaching out to Door County fans in our channels. Sunday morning in 3 hours. 7 – 10 am. 77 clicks through back to resorts website. From 51 different cities around the country. 89% Mobile engagement on 26 different mobile device & tablets. Engage with us today. We can bring near real time results for you. Real ad results. 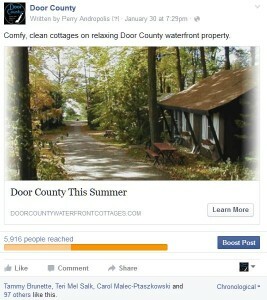 In two days this promoted ad reached 5916 people that had showed some interest in Door County. We can deliver and prevent videos from/about your efforts to a national interested audience. We have 29,000 plus and growing in our channels. Video is a very fast growing segment of digital marketing. We can help you ease into use of these tools of our time for Marketing To A Modern World! A targeted video ad campaign running nationally reached over 10,000 in 3 days with over 4,200 views. Reach out while people are planning, dreaming and scheming their next visit to the county. 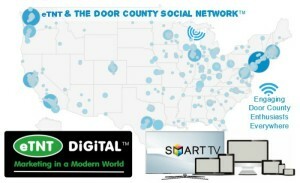 SPONSOR A POST THOUGH THE MASSIVE DIGITAL DOOR COUNTY NETWORK™. BUILD AWARENESS FOR YOUR EFFORTS AND IMMEDIATE LEAD GENERATION. NATIONAL SEASONAL DIGITAL DOOR COUNTY WISH BOOKS. Digital magazine style Door County Wish Books. Designed to format automatically to any device and distributed in waves across the country to both our large national audience (29,000 plus) and put out for discovery for those yet to learn about Door County. The 2015 ‘Live’ Holiday Wish Book was a big success. Digitally broadcast in multiple waves locally, regionally and nationally. It was enjoyed in 257 Cities Around The United States. 99% of the people that love Door County aren’t here 99% of the time! You can reach them through our digital channels. Jump on board. Affordable rates compared to last centuries media. Reach out today get leads tomorrow. DIGITAL INTERACTIVE BROCHURES GUIDEBOOKS. PUBLICATION & DISCOVERY. Quietly helping Door County companies, organizations and emerging brands market to a modern world for years. We are also the lead consultants and behind the scenes support for other agencies and individuals. 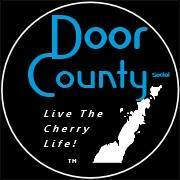 We are the exclusive development and marketing agency of record for the Door County Social Network! eTNT Digital is a Door County based business.